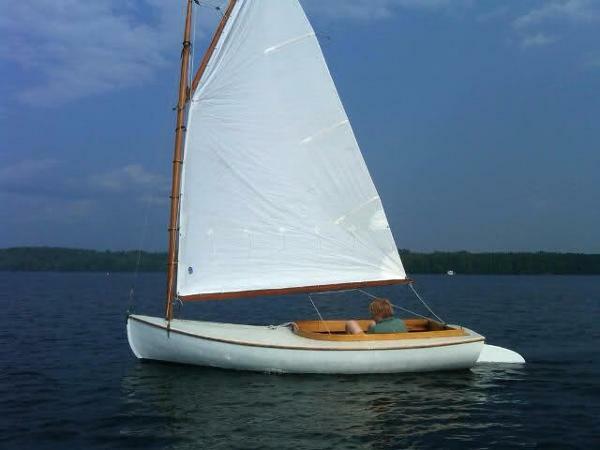 The Beetle Cat is one of the most successful low cost daysailers around. This boating tradition wasstarted by the Beetle family back in 1920, continued by the Concordia Company and today is carried on by Beetle Inc.The Beetle Cat is a fun boat and has been around for a long time. Some Beetle Cat owners belong to the ‘New England Beetle Cat Boat Association’, an association of serious Beetle Cat owners who sponsor regattas and other events involving the Beetle Cat. In order to join you need a Beetle Cat that meets all of the specifications set forth in their rules, which are based on the original specifications of the Beetle Cat produced in the 1920’s and still being produced today. 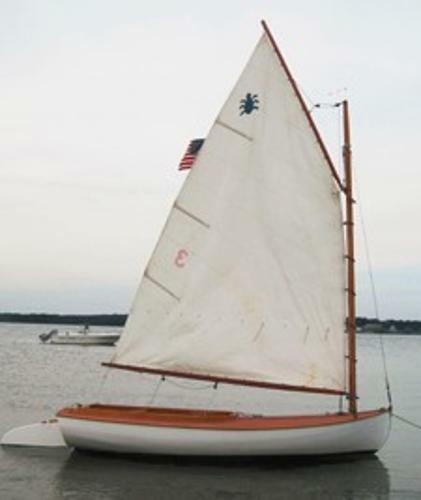 ZEPHYR is a conventional carvel planked wooden boat built to high structural standards. 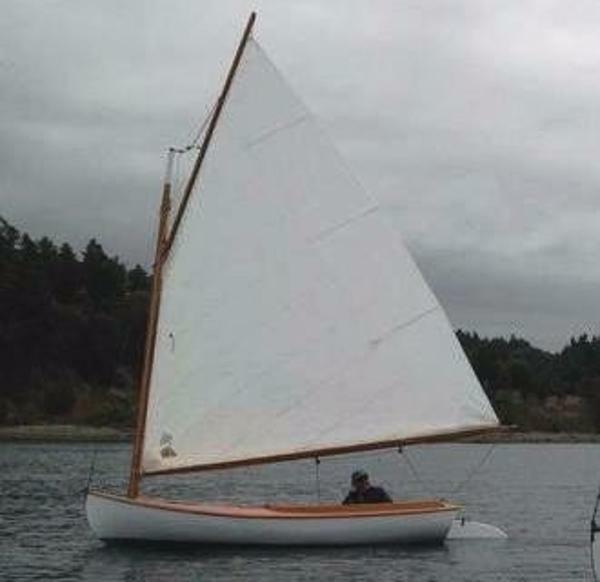 She is gaff rigged and uses a centerboard which can be raised to allow sailing in very shallow waters. The keel and stem as well as the steam bent frames are of white oak. Hull planking and deck planking are of white cedar. The deck beams are of clear pine and sawn to the proper crown. The mast step is oak and is bridged over the stem and keel and through bolted through giving added support to both. The mast partner is also of white oak, making the mast support structure very solid. Added support is given by using a 2 x 3 strong back which runs fore and aft. It runs along the top of the centerboard box and is fastened to a heavy deck beam that help supports the mast partner. The deck beams rest on top of the strong back and are fastened to the sheer clamps. This construction gives the deck the strength to withstand walking or jumping on. The half-inch cedar decking is fastened to the deck beams and the top of the sheer plank. The deck is covered with number 8 canvas duck, and is usually given a penetrating primer coat and another top coat. Coamings are of clear matched oak, steam bent into place and varnished. The color scheme for ZEPHYR is White topsides, Green bottom, Buff decks, Light Gray hull interior and cockpit sole is cedar planking left unpainted. Main sheet traveler, turning blocks and cleat. 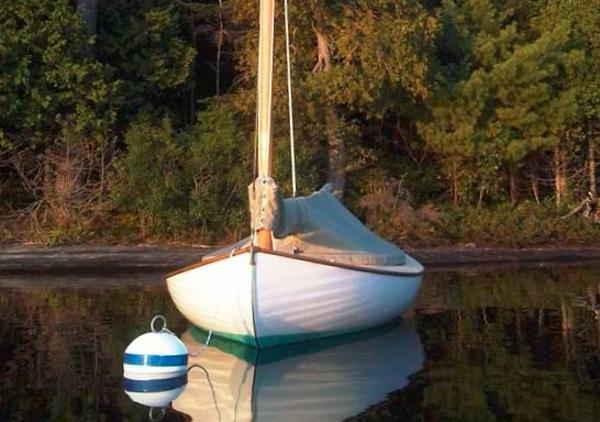 Spars (mast, boom and gaff) are varnished straight grain Douglas fir. Stainless steel wire standing rigging (headstay and shrouds) with bronze turnbuckle adjusters. Running rigging (peak halyard, throat halyard and main sheet) are traditional 3-strand Dacron line. Sail is made off to the rig by mast hoops at the luff and with sail slides on tracks of boom and gaff. Sail Area 100 sq. ft.